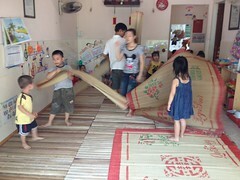 a day at a vietnamese kindergarten | doberman pizza. 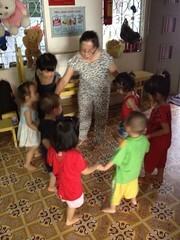 My sister-in-law, Quyên, runs a kindergarten out of her home in Danang, Vietnam. She and her husband had to take a trip to Hu? this weekend, so Qu?nh and I came over to help out. Here’s how the day went. Class starts early in the day. It’s 7:30 AM, and a table’s worth of children, aged around 4-5 years old, have already arrived and have started studying, dotting their i’s, crossing their t’s, and hooking their ?’s. 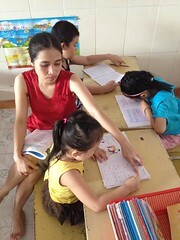 Quyên teaches handwriting, which is a bit advanced for kindergarten, but appeals to many Vietnamese parents who want their children to be well-prepared when they get to primary school. That’s her specialty, but it’s not all she teaches. 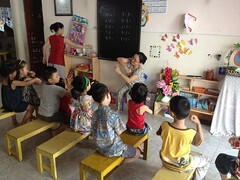 Children learn reading, writing and arithmetic, sing songs and listen to stories. This year, Qu?nh’s brother Nu (who studied architecture in Ho Chi Minh City) has also started teaching art classes after hours, to which parents can send their children separately (although the classes happen in the same place). The afternoon proceeds much like the morning. Children continue to copy down letter forms in their books, in neat little rows, while others play. They repeat sounds out loud as they write down different combinations of letters, to help them learn proper Vietnamese pronunciation. A few younger children—siblings of the older students—have arrived too. A couple of three-year olds tag along after me, shouting to get my attention and offering me cups. I thank them, pretending to take a drink, and they move away. Then they come back again, offering the same deal. And so it continues for the next half-hour, every twenty seconds or so (I timed them). As in all cases with very young children, you gotta adapt, so we gradually turn it into an opportunity for them to practice addressing their elders politely: “Chú ?i (Uncle)! Please have some water!” instead of shouting. They eventually get sidetracked by other things, and I manage to go back to the classroom where I assist Quyên’s boys, who are off to the side learning English. What’s a table? What’s a chair? What’s an eraser? And how do you spell it? The silent e’s in “make a circle” cause no end of confusion. Oh, English. You crazy, haphazard patchwork of a language. How exactly did you become so universal? Don’t answer that. The afternoon is drawing to a close, and parents will soon come to take their children home. The benches are rearranged to form rows, and Lâm (Qu?nh’s mother) takes center stage for game time. The game is some sort of traffic police game: someone acts as a traffic cop, and the rest are all sitting on their benches, riding motorbikes. As far as I could tell, the traffic cop gives directions (like “turn left”, “stop”, and so on) and the rest of the players have to follow the directions. If the traffic cop catches anyone who misses a command, they have to come up and pay a fine(? ), which amounts to singing a song. I’ll have to inquire further to see if we could use this game in our children’s class back home. Anyway, little by little, parents drop in to drive their children home. One by one, boys and girls graciously go to each of their teachers to announce their departure—“th?a bà, con v?”, “th?a cô, con v?”—as the Vietnamese culture of respect for elders demands. Eventually, only Quyên’s boys remain, along with one more girl whose parents let us know that they would be at work late. We sit down for dinner—bánh canh cua, or thick noodles with crab. By the time I Ieave the schoolhouse, it’s past 6:30 PM, for a work day of eleven hours. This entry was posted in asia chronicles, baha'i blog, journal and tagged children's classes, education, quynh, service, trust, vietnam, work by danger. Bookmark the permalink. Pingback: a day at a vietnamese kindergarten | bahá'í children's class ideas!